For centuries the writings at Sirila Visvanatha Cakravarti Thakur have provided irreplaceable nourishment tor Gaudiva vaisnavas on all levels at spiritual development. His life was an inspiration, as was his legacy: the literatures he composed to benefit generations at the Lord’s devotees. His compositions include prayers, songs and narrations at the pastimes at Sri Caitanya Mahaprabhu and Sri Krsna: commentaries on texts such as Srimad-Bhagavatam, Bhagavad-gita and the writings at the six Gosvamis of Vrndavana; and detailed descriptions at both the science and practice at bhakti. 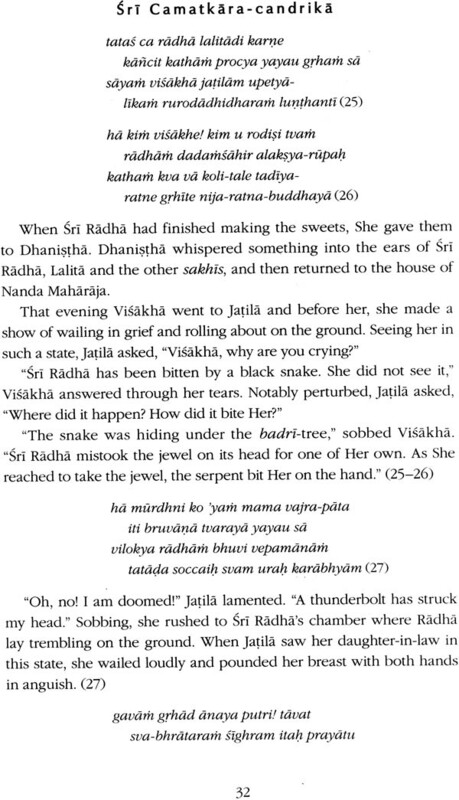 Sirila Visvanatha Cakravarti Thakur ‘s beautiful Sri Camatkara-candrika comprises narrations at tour at Sri Radha-Krsna ‘s enchanting pastimes These stories are so charming that one Gill effortlessly become joyfully absorbed in them. By their very nature they allure the reader to relish the eternal sweetness at the transcendental realm. 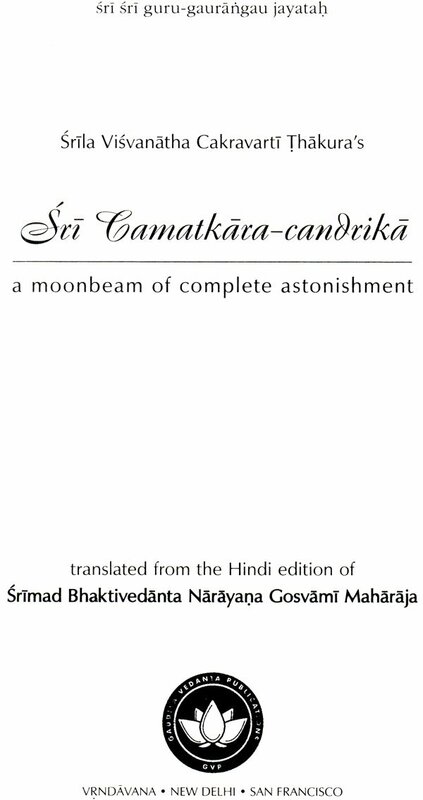 I feel supremely happy today that the faithful reader is being presented with this Hindi edition of Sri Camatkara-candrika, composed by Sirila Visvanatha Cakravarti Thakur. He is the highly exalted preceptor (maha-mahopadhyaya) and crown-jewel of the Sri Gaudiya Vaisnava acaryas. Among all artists who depict Sri Radha-Govinda’s pastimes, he is the most expert. This incomparable narrative poem have been painted with the soft brush of his supremely sweet and natural prema-bhakti and the colour of the all enchanting nectar of rasa. This literary composition consists of four astonishing and delightfully charming stories of the mischievous meetings of the Divine Couple, Sri Radha-Krsna. 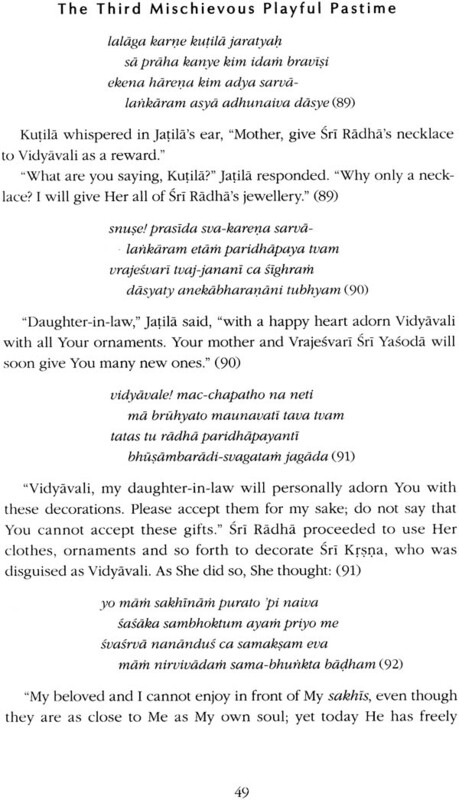 It is presented for rasika and bhavuka readers, as well as sadhakas who desire to taste vraja-rasa. 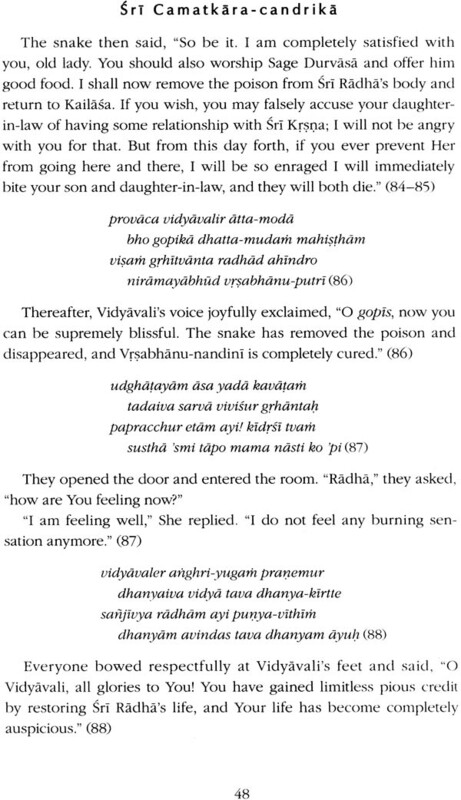 Sirila Visvanatha Cakravarti Thakur has cleverly crafted this poem with simple yet profound language, in such a way that the charming transcendental sentiments of these four pastimes will astound and infatuate the hearts of all devotees who are expert in tasting transcendental sentiments. These pastimes are filled with the transcendental mellow of laughter (hasya-rasa), which will submerge all readers in an ocean of blissful delight. The scriptures on rhetoric say, “rase sarah camatkarah - the essence of rasa is astonishment.” This book is the very essence of rasa, and thus it derives its name, Camatakara-candrika - a moonbeam of complete astonishment. “Ramyavastu samaloke lolata syat kautuhalam - ‘eagerness’ (kautuhalam) means that a sense of desire, or longing, is born when one simply sees a charming, heart-stealing object.” The essence of this saying will automatically be realised in the heart of the readers. 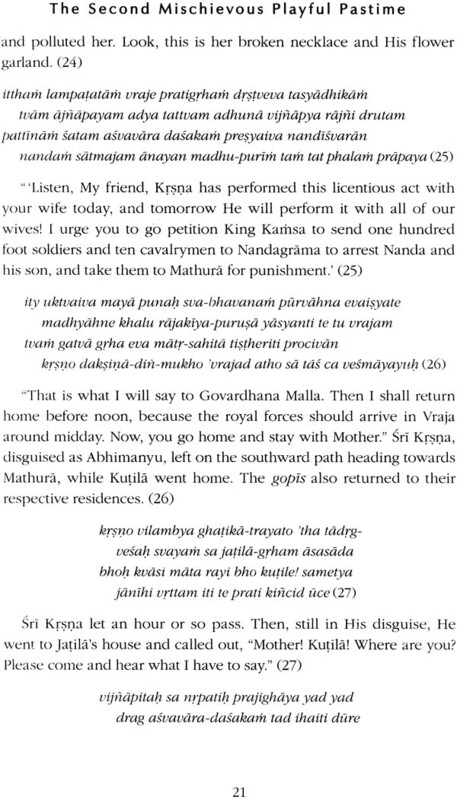 The variegated playful pastimes in this book are all the more astonishing because those who constantly oppose Sri Radha having any association with Sri Krsna, actually assist in Their meeting each other. The first mischievous playful pastime is the meeting in the box. 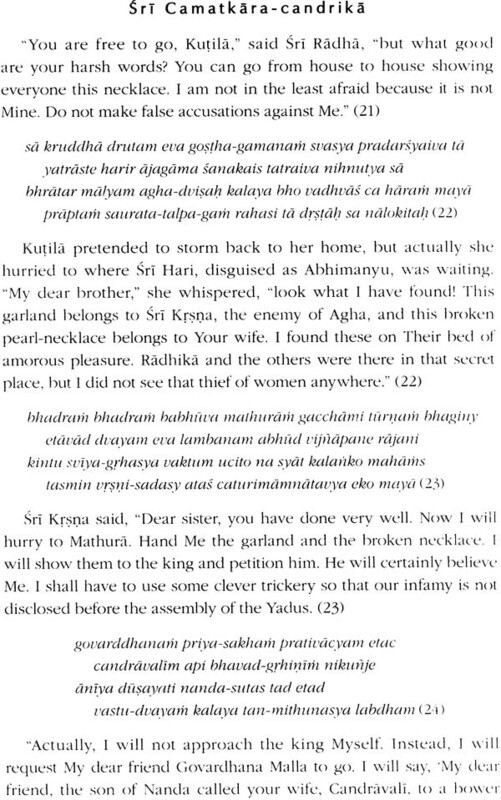 In the second pastime, Sri Krsna disguises Himself as Abhimanyu to meet with Sri Radha, In the third pastime, He disguises Himself as a female doctor and goes to treat Sri Radha, Finally, in the fourth pastime, Sri Krsna disguises Himself as a beautiful female singer in order to meet with Sri Radha. These pastimes are alluded to in abundance in the poetry and songs of self-realised personalities. It is said that these four pastimes have been written for the four parts (yamas) of the night, to facilitate a person’s staying awake during the night of Ekadasi, Moreover, Vaisnavas of former times would taste and deliberate upon the pastimes described in this book. They would share a variety of transcendental moods and experience astonishment. In this way they would become supremely blissful. Sirila Visvanatha Cakravarti Thakur appeared in a family of brahmanas from the Radhiya community of the Nadiya district, West Bengal. He was celebrated by the name Hari-vallabha, and had two older brothers, Ramabhadra and Raghunatha. During his childhood he completed his study of grammar in the village of Devagrama, and then studied devotional scriptures at the home of his spiritual master in Saidabada village in the Mursidabad district. During his time in Saidabada he wrote Bhakti-rasamrta-sindu-bindu, Ujjualanilamani-kirana and Bhagavatamrta-kana. Soon after this he renounced household life and went to Vrndavana, and there he wrote many other books and commentaries. After the disappearance of Sri Caitanya Mahaprabhu and His followers, the Six Gosvamis of Vraja, the current of unalloyed devotion (suddha-bhakti) continued to flow through the influence of three great personalities: Srinivasa Acarya, Sri narottama Thakura and Sri Syamananda Prabhu. Sirila Visvanatha Cakravarti Thakur is fourth in the line of the disciplic succession from Srila Narottama Thakura, Srila Narottama Thakura had a disciple named Srila Ganga-narayana Cakravarti Mahasaya who lived in Balucara Gambhila in the Mursidabad district. 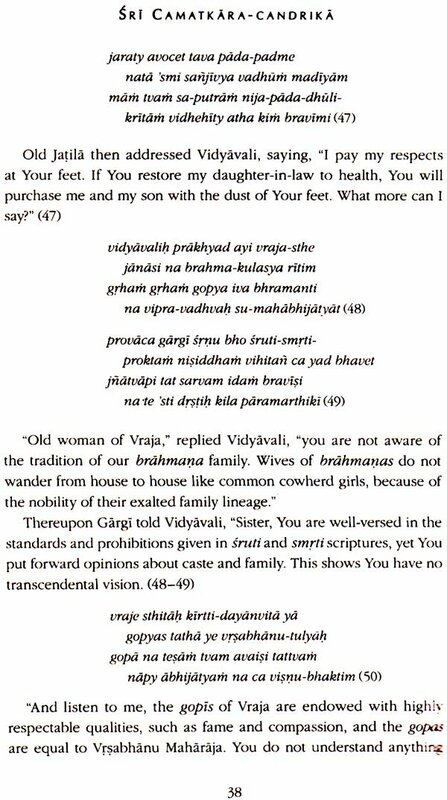 Ganga-narayana had a daughter named Visnupriya, but he had no sons. Therefore he adopted a devotee called Krsna-carana as his son. This Krsna-carana was the youngest son of another disciple of Srila narottama Thakura named Ramakrsna Bhattacarya, who came from the brdhmana community of Varendra. Sri Krsna -carana’s disciple was Radha-ramana Cakravarti, who was the spiritual master of Srila Visvanatha Cakravarti Thakura. In this verse the name “Sri Rama’’ refers to Sirila Visvanatha Cakravarti Thakur’s spiritual master, Sri Radha-ramana; “Krsna” refers to his grand spiritual master (parama-gurudeva), Sri Krsna-carana: “Ganga-carana” refers to his great grand spiritual master (paratpara-gurudeva), Sri Ganga-carana, “Narottama” refers to his great-great grand spiritual master (parama-paratpara-gurudeva), Srila narottama Thakura; and the word “natha” refers to Srila nrottama Thakura’s spiritual master, Sri Lokanatha Gosvami. In way he is offering obeisances to his disciplic succession (guru-parampara) up to Sriman Mahaprabhu. Once, an estranged disciple of Hemalata Thakurani named Rupa Kaviraja concocted his own doctrine, which opposed Gaudiya Vaisnava conclusions. He taught that only those in the renounced order could act as acarya, householders could never do so. 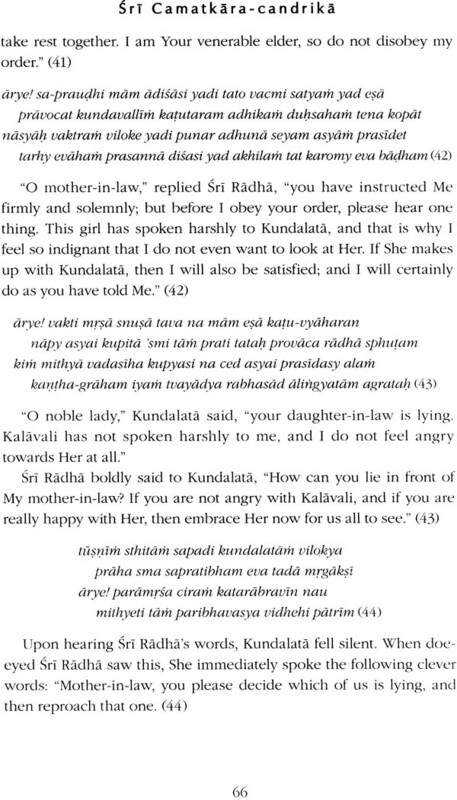 Rupa Kaviraja disregarded the devotional path of regulation (vidhi-marga and propagated a doctrine of spontaneous attraction (raga-marga) in a way that was undisciplined and disorderly. His new new stated that one could abandon the practices of hearing (sravana) and chanting (kirtana), and practise raganuga-bhakti by remembrance (smarana) alone. 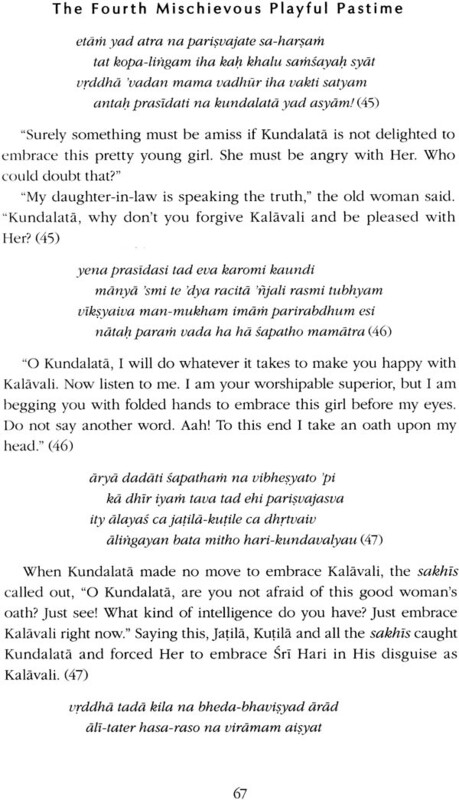 Hemalata Thakurani, the daughter of Srinivasa Achrya was extremely learned and a great Vaisnavi and she ensured the Rupa Kaviraja was expelled from the Gaudiya Vaisnava community. Since then the Gaudiya Vaisnavas have known him as an atibadi [a person from one of the eleven unauthorized, sahtya communities that concoct their own method of devotional service].